Saucon Valley survived the Blue Bomber blitzkrieg on Friday night and remained unbeaten for this season. As usual, throughout the game exists quite a few FANtastic plays that are worthy of our weekly Krunch Time! award. 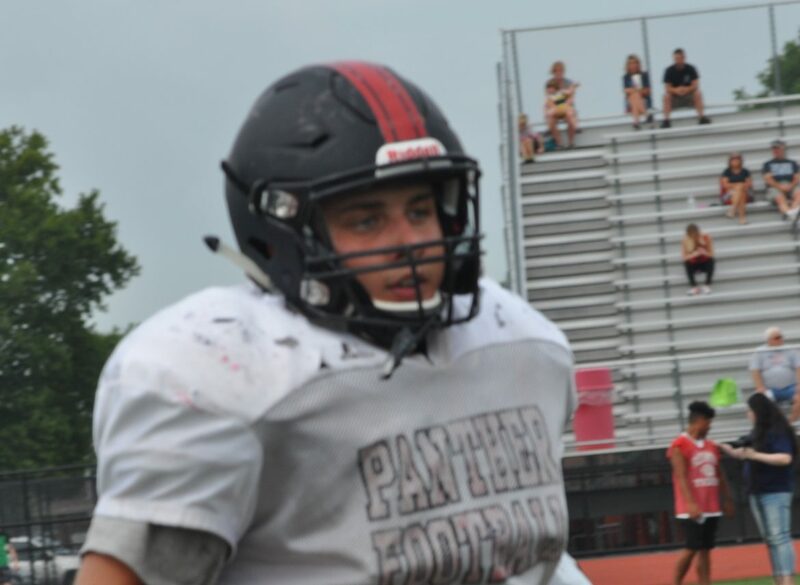 However, it was the way that Panther defensive-tackle Jared Harka started and finished the game that caught our eye. Harka gives us a double dose of Krunch Time! On the first play of the game Harka (#61) is aligned at his right defensive-tackle position just inside the near hash marks at the 30-yardline. From the near slot position, Blue Bomber running-back, Aaron Stasko (#1), motions toward Harka and takes the handoff in stride on a “jet sweep”. With a little help from teammate Evan Deily forcing Stasko back to the inside, Harka defends against a double-team, pushes upfield and drops Stasko for a four yard loss. Here is Harka again on the last play of the game. Trailing by eight points and desperate, the Bombers are looking to throw the ball down the field for a big play. Once again, Harka has other ideas from his defensive tackle position. On the snap of the ball Harka gets a quick takeoff upfield, beats his blocker with a bull-rush and sacks the Palmerton quarterback to end the game and preserve the victory! In recognition of this “Krunch Time!” award, the Culinary Experience & Catering is rewarding Jared with a $12 meal voucher to be redeemed at the next Saucon Source Post-Game Tailgate Party at the Waldheim Beethoven Club on Friday, Sept. 14. Friday night the Panthers travel to Salisbury to take on the Falcons. Great job Jared, the Source is with you!